Virginia holds a significant place in American history. As one of the 13 original colonies and the home state of George Washington, Thomas Jefferson, and other important historical figures, it should come as no surprise that we celebrate Independence Day big here. With a collection of parades, music festivals, and awe-inspiring firework displays, you’re in for a good time. Here’s how to have the perfect Fourth of July in Virginia! The Cape Charles Fourth of July is a classic event. Kick the day off with a parade starting at 9 a.m. The parade includes fire trucks, horses, singing, children’s decorated bicycles, and more. Local vendors set up booths all along the street, including craft and artisans and restaurants. Live musical acts play throughout the day, capping off with fireworks after dark. The Omni Homestead is a Certificate of Excellence award winner from TripAdvisor and provides a beatific backdrop to celebrate Independence Day. The Omni Homestead celebrates the Fourth of July over the course of a four-night concert. From June 29 through July 8, the Homestead will offer a fun run, fireworks and barbecue snacks, golf clinics, family fitness classics, petting zoo, and live music to its guests. The weekend ends with a tremendous firework display. Middletown is one of the most charming small towns in Virginia, and their Fourth of July Celebration celebrates that fact. The celebration kicks off with a softball tournament, crafts fair, and carnival. Throughout the day, live musicians play and local vendors provide food. At 5 p.m., the Middletown Volunteer Fire and Rescue Company host the annual parade before fireworks that night. George Washington’s plantation home, Mount Vernon, celebrates Independence Day like none other. The entire event is referred to as “An American Celebration,” and includes a naturalization ceremony for new citizens, military reenactments, a wreath laying ceremony, daytime fireworks, and a concert by the National Concert Band. And if that’s not enough, keep in mind that cake is served. Williamsburg, Virginia, is one of the most historic places in the country. Residents celebrate the Fourth by reading the Declaration of Independence from the Courthouse Steps in Colonial Williamsburg before a Fife and Drum Corps salute. Most have casual picnics on the grounds of Colonial Williamsburg. We recommend picking up to-go boxes from the Cheese Shop or Pierce’s Pitt Bar-B-Que. Kids can play 18th-century inspired games before the fireworks. Yorktown is one third of the Historic Triangle, and as such takes Independence Day seriously. Start the holiday itself at 8 a.m. with a four-mile race. At 2 p.m., enjoy a cardboard and duct tape boat race. And at 10 p.m., finish off the night by gathering under the sparkling fireworks with your friends and family. Head down to 24th Street near the Ocean Front Dairy Queen for multiple live musical performances. The Tidewater Winds, one of the country’s few professional non-profit concert bands, is set to play. Further down the boardwalk, the Deloreans will play from 7 p.m.-11 p.m. All shows are free and open to the public. Fireworks start at 9:30 p.m. The Wintergreen Resort celebrates the Fourth of July like a celebrities’ birthday party, with four full days of events starting on Friday, June 29. Over the course of the weekend, families can take part in bonfire storytelling, live outdoor music, a block party specifically for kids, chairlift rides, and movies under the stars. Cap everything off with fireworks the evening of July 3! 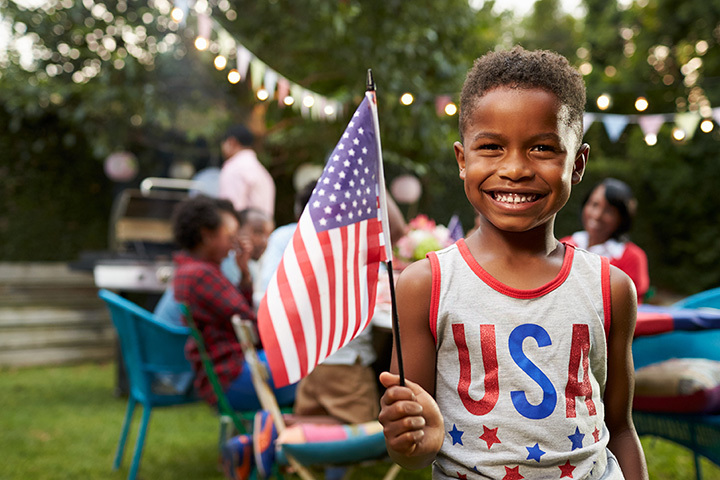 Wytheville, Virginia, carries on the small-town American traditions of Fourth of July children’s parades and celebrations. Food, drink, bounce house, antique cars—Wytheville has it all. Visitors can participate in Skeeter’s Hotdog Eating Contest before heading down to Elizabeth Brown park for fireworks. Active and retired military are welcome free of admission to the Kings Dominion amusement park from June 30-July 4. Come by to see the red, white, and blue decorations, take in the military band performances, and watch the incredible firework displays each night. Besides that, you can take advantage of all Kings Dominion has to offer, including rides, food, and shows. View more Virginia July 4th Fireworks and Celebrations.